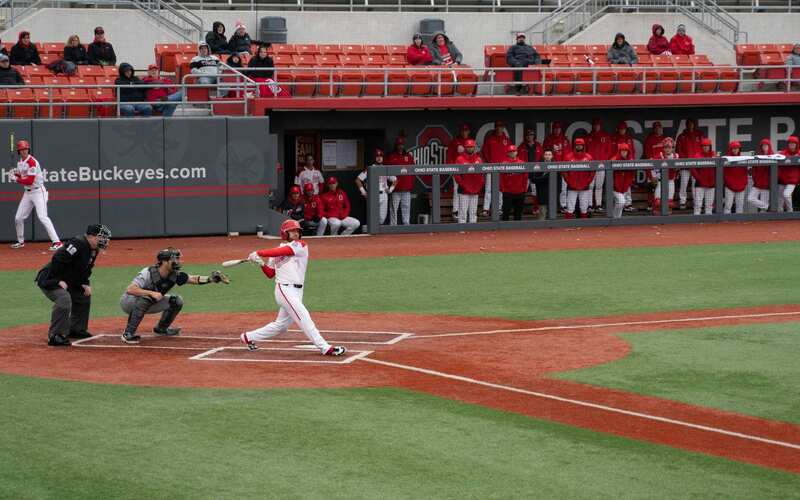 The Ohio State baseball team overcame an early 6-1 deficit to claim its second-straight victory. Ohio State (10-10) rallied to beat Northern Kentucky (4-13) 10-8. The Buckeyes produced 14 hits, including two home runs, in the win. After trailing 6-1 heading into the bottom of the fourth inning, Ohio State cut into the deficit to just a run by the bottom of the seventh inning. With one man on, redshirt sophomore catcher Brent Todys lifted a home run over the left field wall to give the Buckeyes their first lead of the game. “[The mindset was] just competing. I’d been struggling of late. Just going out there and putting that bat to help the team string together something,” Todys said. Five Buckeyes recorded multi-hit games, including a three-hit, two-RBI game from senior left fielder Brady Cherry. The freshmen especially shined, combining to hit .417 with five RBI. After a pair of hard groundouts started the game for Northern Kentucky, redshirt senior designated hitter Will Haueter hit a two-out double down the third base line to give his team a runner in scoring position. The Norse capitalized with a two-run home run by sophomore first baseman Griffin Doersching. Following a quick two outs in the Buckeyes’ half of the inning, Cherry snuck a ball down the third base line. Junior first baseman Conner Pohl drove home Cherry with a single to right-center field, cutting the deficit to 2-1 after one inning. Following a hit batsman and a wild pitch, a single to center put runners on the corners with one out in the top of the third inning. 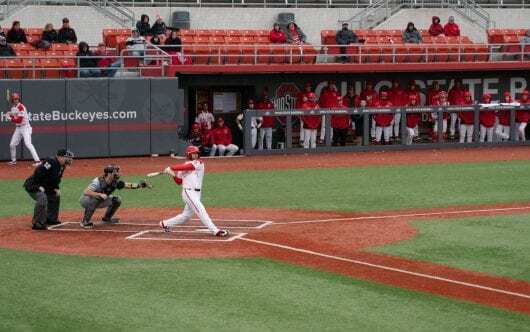 A strikeout got the second out, but a fielding and a throwing error by Ohio State freshman third baseman Zach Dezenzo allowed the Northern Kentucky runner from third to score. On the same play, junior right fielder Dominic Canzone roped a throw from right field to record the final out at the plate and keep the score at 3-1. Ohio State head coach Greg Beals noted the importance of the play to bail them out of the inning and prevent further damage. “That’s what you expect out of your big-time players though. Dom’s a big-time player for us. We needed him to make big plays,” Beals said. Junior pitcher Jake Vance recorded two strikeouts in the fourth inning, but two doubles put another run on the board for the Norse. A two-run home run from redshirt freshman left fielder Sam Hedges put Northern Kentucky ahead 6-1. Vance exited the game after four innings. He allowed five earned runs with four strikeouts. But Todys said the team kept its head up even with the five-run deficit. “We felt like we were still in it, and we felt like our bats are good enough right now to where we can get ourselves back into the game when we are down like that,” Todys said. Ohio State freshman designated hitter Marcus Ernst was able to immediately respond with a leadoff single in the bottom of the fourth. Freshman center fielder Nolan Clegg launched the first home run of his collegiate career to reduce the Norse lead to three. A fielding error and a hit batsman kept the inning alive for the Buckeyes with two outs. Cherry took advantage with a two-RBI double to deep left-center field to make the score 6-5. “That four runs in the fourth for us kind of put us back in the mix and gave us that believing feeling,” Beals said. Northern Kentucky started the sixth inning with a pair of walks, and a bunt by Northern Kentucky advanced the runners into scoring position with one out before a sacrifice fly by Hedges moved the score to 7-5. Ohio State freshman pitcher Bayden Root stepped on the mound in the seventh inning and he struck out three, surrendering one hit. Pohl was able to hit a double in the gap in right centerfield to open the bottom of the seventh. Dezenzo drove a hard liner to third base, which bounced off the diving third baseman’s glove for a double, bringing home Pohl to cut the Ohio State deficit to one. This set the stage for Todys to lift the Buckeyes ahead with his two-run home run. Following a strikeout to record the second out of the bottom of the eighth inning, a pair of bases-loaded walks pushed the Ohio State lead to 10-7. The ninth inning proved difficult for the Buckeyes for the second-straight game. Northern Kentucky loaded the bases with two outs, and a passed-ball strikeout reduced the deficit to two. Junior pitcher Andrew Magno struck out the final batter to earn his second save of the year, as the Buckeyes survived another late-game scare. “Those experiences, I think, are thickening our skin a little bit, toughening us up. Our guys again survived,” Beals said. Root earned his first collegiate win with a four-strikeout performance in 2 2/3 innings of relief. “This was a big game, because this gets us back to even ground. Now we just go in and never look back,” Todys said. Ohio State will return to start a four-game series with Hawaii at Bill Davis Stadium at 5:05 p.m. Thursday.